Addressing Arch Pain: Is Your Abductor Hallucis the Source of Mobility Issues? Arch Pain: Is Your Abductor Hallucis Killing You? Is your abductor hallucis muscle killing you? 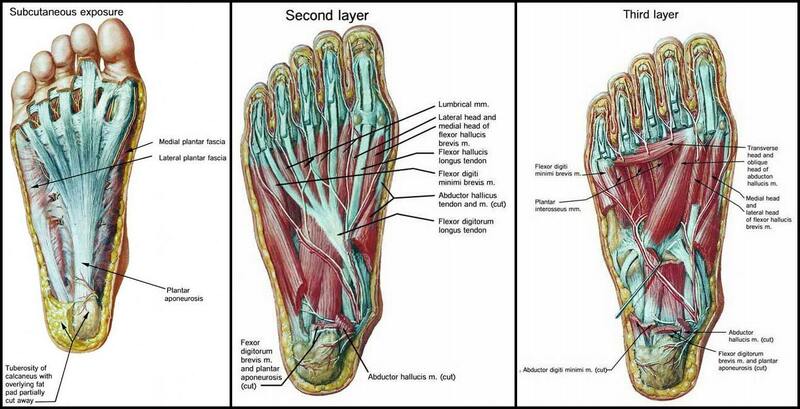 This foot arch muscle starts at the inner heel bone and runs down the inside arch of your foot to the big toe. Often, pain in this area is mistaken for plantar fasciitis. The abductor hallucis doesn’t get a lot of street cred, but it supports a tremendous amount of weight as you stand. We’ll tell you how one of our patients was able to find relief from arch pain, and discuss a few little-known treatments you can apply at home. Check out the foot’s anatomy. You can see the abductor hallicus muscle along the inner arch in the center of the foot. A few years ago, we had a patient named Jenn come in complaining of chronic foot arch pain. She had gotten a new German Shepherd puppy six months prior and had been taking a lot of daily walks. She started experiencing a dull aching and tenderness, starting in her arches and extending up through the ankle joint. The location of the arch pain corresponded with the abductor hallucis muscle, which moves from side to side in the arch of the foot. Many people with this pain tend to overpronate — which means their feet roll too far inward during the gait cycle. In addition to overpronation, we noted that our patient had particularly high arches and weak ankles. After fitting her with orthotic shoe inserts and suggesting she buy a new pair of athletic shoes, her pain subsided almost immediately. Three years later, she came back to us with the same pain. Since her last visit, she had gained 50 pounds while pregnant with her first child. Though she lost the weight within six months, the foot pain was still remained with as little as an hour of walking or standing. It is not uncommon for the foot shape and size to change during pregnancy due to hormonal changes and a loosening of the ligaments in the entire body — foot included. The increased weight and stress can certainly overtax the abductor hallucis muscle. On top of that, shoe orthotics should be sent back to the manufacturer every so often for refurbishment. A soft shell orthotic should be refurbished about every two to three years. We are happy to help patients with the routine care of their orthotics. Long-term, the regular use and maintenance of orthotic devices will help correct the biomechanical issues without surgery. We had explained this to our patient, of course, and one of the main reasons she came back to see us was, in fact, to have her orthotics sent in for refurbishment. Not all patients are so proactive about arch pain and foot health. There is some consequence to letting chronic arch pain continue. Complications may include the development of plantar fasciitis, bunions, shin splints, stress fractures, and difficulty walking. So we had a few other suggestions to help this patient — and others like her — prevent the return of foot arch pain. In Addition to Orthotics, Try These Arch Pain Treatments! – The Short Foot Stretch: Studies show that the short foot stretch, in addition to orthotics, is a powerful way to strengthen the intrinsic musculature of the foot and prevent further pain or complications. You can watch a demonstration of how to do the short foot stretch in this YouTube video. The single-leg stance short foot stretch is considered to be most effective. – Foot Taping: If your foot tends to fall out of proper alignment as you walk, it may be helpful to sometimes wrap the foot when you plan to do a bit of extra standing or walking. The binding adds support and prompts greater circulation in the area, which you may find relieving. Livestrong demonstrates one technique for wrapping the arches. – Icing: Whenever pain recurs, the foot can be iced for 10 minutes every hour. After the first few hours, you can reduce the frequency of application until pain and swelling diminish — or down to two or three times a day. Alternative therapies to treat severe, acute pain within the first 48 hours to a week of onset include deep tissue sports massage and ultrasound electrotherapy. The foot doctors at The Center for Podiatric Care and Sports Medicine can effectively treat your arch pain. We can evaluate the possible biomechanical causes of arch pain, cast you for orthotics, show you how to properly tape your arch for added support, and direct you on exercises that will strengthen your foot muscles. Remember, pain is not normal. Don’t delay! Book with our Manhattan or Westchester foot and sports medicine doctors online. » Are Stress Fractures Preventable?